Primary purpose: Pottery Lessons including but not limited to clay hand building, pottery wheel & sculpture. This is a well lit purposefully designed studio that could accommodate up to 20 art students depending on the nature of the class. The kiln area is adjacent to the studio in a semi-open air environment. Our kiln area will accommodate full production electric kilns and a Raku kiln. Nelson earned a BFA and an M.Ed from the University of Montevallo and has been teaching in the public schools since 1996. His professional career as a sculptor compliments his role as a teacher. Through hard work and his love for art, Nelson’s sculptures have continued to evolve and grow with each passing group of students. He sees the students as an inspiration. “Teenagers live in an imaginary world,” he says, “and it’s that imagination that inspires me”. Nelson is known for his whimsical and entertaining animal sculptures and paintings. He has had multiple corporate and museum purchases. Danielle Tickell is a BFA graduate of the University of Montevallo and a local artist with a laid back teaching style. She is currently pursuing a Masters in Art Education. Her objective is to help students improve their skills and knowledge of art. You will learn the elements of contrast, depth, and tangible atmosphere with various drawing medias. Nita Terrell is a graduate of the University of Montevallo where she received a Bachelor of Fine Arts (B.F.A) degree. She currently resides in Alabaster, Alabama, with her husband David and son Eli. Nita started working again in ceramics in 2009. She finds joy in creating functional pieces that become a part of someone’s everyday-life or special occasion’s pieces. Much of her work is created by incorporating and combining both wheel-thrown and hand-building components to create subtle but basic design. All of her unique ceramic pieces are food-safe, lead free, microwave and dishwasher safe, yet maintain her signature designs that have simplistic yet elegant lines. She started teaching ceramics in 2012 to children and adults, and today continues to share her enthusiasm and knowledge of ceramics. Through teaching these classes she has evolved as an artist and is constantly changing and improving her ceramic process. Amy Pickens – local artist on Willow Island Road, Shelby, Alabama. Amy spent many years working in the jewelry design industry. An art school graduate, Amy is ready to share her talent and insights with her students. 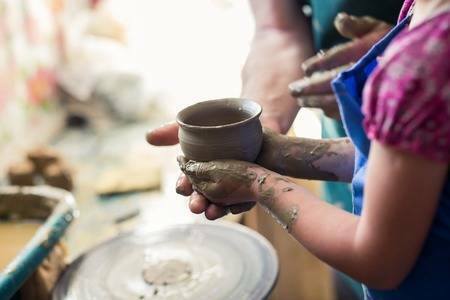 She lends her skills in leading our Creating in Community – Sculpture/Pottery evenings. Candye Lundy is a beginning hand-building pottery instructor for the SCAC. She specializes in creating large serving vessels and funcational pottery pieces. Under Candye’s guidance you will learn the basics of utilizing clay to create funcational art. Candye lives with her husband, Don, at the tranquil Horsefeathers Farm. She has a background in interior design. Sandra Annonio has lived in Shelby County since 2001. She and her husband Bill relocated to Alabama from South Florida after purchasing a staffing agency in downtown Birmingham. As a graduate of Georgia Southern University with a degree in Marketing, Sandra joined the team part-time working in marketing/administrative office assistance to build awareness of the SCAC. She has recently taken on the Bookkeeper position. In addition, she has taken many.many hours of pottery classes and sells her items through local art show. She is a partner in County Road Raku Pottery which specializes in Horse Hair Raku pottery. She has two daughters, Jessica and Amanda. Sandra serves on the Board of the Alabama Symphony Volunteers Council.